It's coming up on the last week of National Craft Month, so let's finish it up in style! For our last NCM contest, we'd like to challenge you to make a pretty cover for your sewing machine. 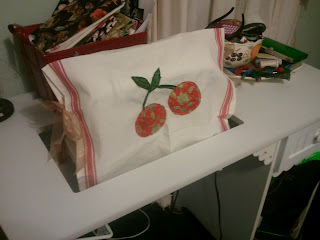 Carrie sent us a pretty one made from a dishtowel for our last contest, isn't it cute? We'd love for you to use your imagine and "think outside the box" for this! Use creative materials, bold prints, maybe even get outside your comfort zone and try a new technique! 1. Sew a cover for your sewing machine or serger. 3. Take a picture of it, and email it to rebecca@arrowcabinets.com by Friday, March 30th at 10 am Eastern time. Remember, creativity counts!! Don't be afraid to go for it!